Welcome to the Showpigeons website, the official website for the "British Pigeon Show Society", the "British Nun Club" and the British "Owl, Frill & Turbit Club". Showpigeons is intended to supply information on the British Pigeon Show Society, with details on our history and forthcoming show at Barnsley Metrodome ( classification and entry forms ). Also included are pages about Nun pigeons and Oriental Frills, African Owls & Turbits, again with details about their histories, show standards and breeding tips. Barnsley show is organised by The British Pigeon Show Society under the auspices and rules of the National Pigeon Association and British Pigeon Show Society, and is proud to have been chosen as the National Pigeon Associations host of the prestigious "National Championship Show". 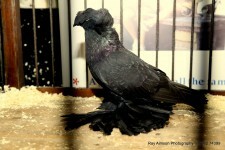 Our pigeon gallery is presented with the kind permission of Ray Aimson , a professional photographer,all the images on this page were taken at the BPSS/NPA National show at Barnsley Metrodome and illustrate some of the pigeon breeds regularly exhibited at the show. See LINKS for Ray's details. The BPSS would like to congratulate Adrian Knaggs, for winning "Supreme Show champion" at the 2018 show, with a Black Norwich Cropper. Richard Henderson's Andalusian Nun was Reserve Show Champion for the second year running. We do hope you enjoy browsing through "Showpigeons", as much as the committee of the BPSS enjoy being involved in "the best hobby in the world". The 2019 show is being held once again at the Barnsley Metrodome on Saturday 30th November and Sunday 1st December. 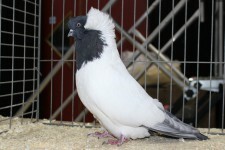 For any exhibitor gaining `Best of Breed` at Pickering, York or Barnsley we would like to include a photo of the bird on the "Showpigeons" web-site. This would be limited to one photo per breed. We would need the exhibitor to e-mail a digital photo in an attachment to the e-mail address on the contact page of the web-site. "Supreme Show Champion" would gain the homepage slot. This is a unique opportunity to promote your breed. Please include your name, breed, colour of your bird and class number. For any exhibitor who has won `Best in Show` in previous years, at either Pickering or Doncaster, please e-mail a digital photo of the bird, as we would like to build up a photographic record of it`s achievement.